Have we found a planet like Pandora as shown in the Avatar ? We still do not know yet but NASA has confirmed that its planet hunting spacecraft, Kepler, has discovered the first alien world within the star’s ‘habitable zone’. As NASA puts it, habitable zone is the region where water can exist on the planet’s surface. The spacecraft Kepler has discovered more than 1000 planets of which 10 are earth sized and located near their own star aka the sun. It was launched on March 7, 2009 to conduct a mission to find Earth like planets for 3.5 years. And at last, NASA has found one. The confirmed alien world which has potential for living, Kepler-22b, orbits a star similar to our sun and is located in the habitable zone. According to NASA, they still do not know yet if the planet has rocky, gaseous or liquid composition. By the picture that has been released, which of course is illustrated, it doesn’t look rocky at all! Its more like a planet full of water. Let’s wait for NASA’s future updates about the planet’s composition. This is a major milestone on the road to finding Earth’s twin. Kepler’s results continue to demonstrate the importance of NASA’s science missions, which aim to answer some of the biggest questions about our place in the universe. 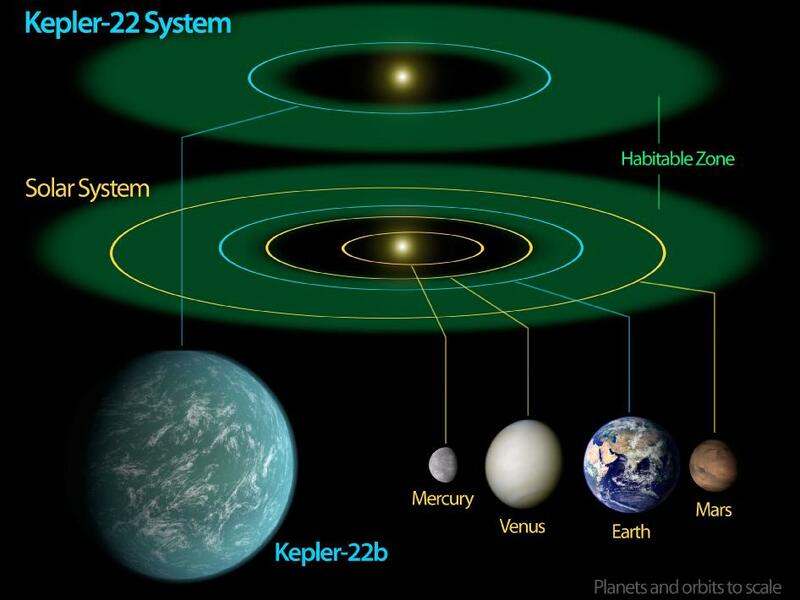 Kepler-22b is about 2.4 times the radius of the Earth and orbits a star similar to our sun for 290 days. The planet’s star belongs to the same class as our sun called the G-type which is smaller and also cooler. Not as fierce as our sun. Now comes the interesting part. Its location. 600 light years away. 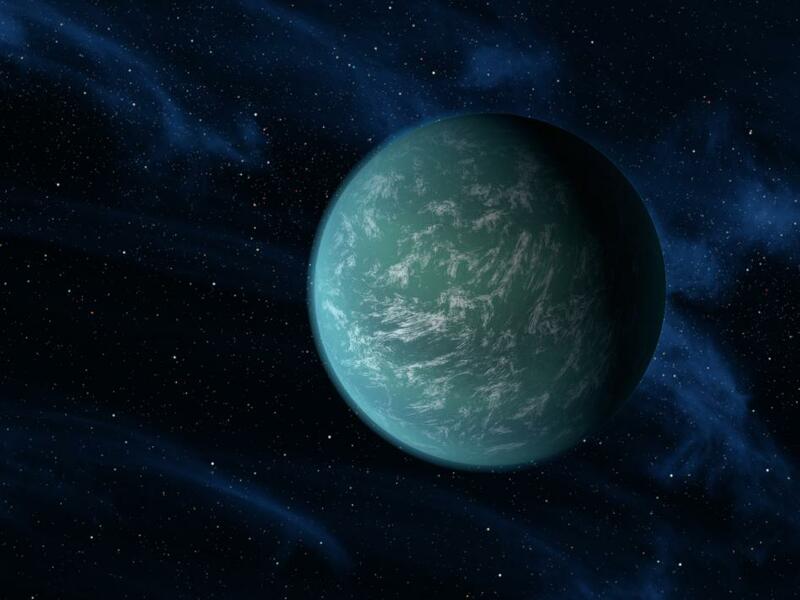 How long would it take to travel to Kepler-22b if found habitable ? Well, I did a little bit of research and found out different results. It actually depends upon the speed of the spaceship that you will be travelling on. Now if we are to travel at the speed of light, it might take 600 years to reach there. What ever maybe the timespan, when Earth will have no space left for humans to live we either have to find a new planet or kill people to have space. Obviously, the second choice shall never be met. Therefore, NASA needs to make ‘spaceships’ able to travel at such high speeds! Simply upgrade the technology! I love the color of this planet, informative post, but in all honesty the name sounds like the name of a dog. Great info Mushfique article is really interesting. I will be waiting for futher updates on this new planet. Keep it up dude! Thanks Akbar! Do check out NASA's website for more updates! I feel such a loss that it is so far. A math problem for you wizards the Saturn 5 moon rocket top speed =25053 MPH or 7 miles a second launched from earth. Crunch some numbers and some imagination and see if it gets closer. Do check out NASA's official website to get more updates on Kepler!